Raid Signups - How they work! re: Raid Signups - How they work! To help with the organisation of raids attendance will also factor in signups when calculating players attendance score. All signups are organised via the in game calendar which can be easily activated by pressing the icon at the top right of your mini map. 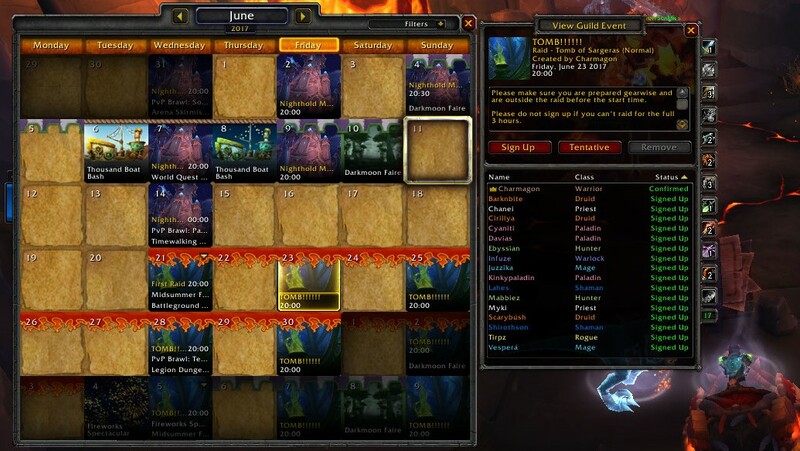 From here you will see the up coming events from blizzard, as well as events planned by the guild. Please pay attention to the description at the top of the screen above the signup buttons as this will include important information about what is expected during the raid. The following is important information on what each button means. If you would like to attend a raid and will be available then members are advised to press the "Sign up" button. From here, your name will be added to the list and the raid leader will make selections based on what is available 24 hours before the raid takes place. If you signup and your signup is altered from "Signed Up" to "Confirmed", this means that you have been selected for the raid and your spot is safe. If it gets changed to "Standby" Then you will still get attendance provided you are online when the raid starts and for 15 minutes after but you won't be raiding unless another drops out. This will only normally happen if the content is difficult, if we have enough of a particular role or if an insufficient number of healers are available to support the additional spots. It may also be the case that the player has been put on standby for not meeting the minimum requirements for the raid, so if you are unsure then speak to an officer. If a player signs up and is confirmed but fails to attend the raid, they will receive a negative attendance. This will greatly affect your attendance score which could result in demotion or a failure of a raid trial. If you are unsure if you will be able to make a raid or not or are unable to attend the full duration then the guild advises that the person signs up as tentative. If there is room in the raid, then we will allow tentative people to join but they will not get full attendance but instead will be rewarded 75% of that raids worth. Officers have the right to waver this penalty as long as direct communication is maintained between the player and guild management. It is important to note, if players signup as tentative they are not guaranteed raid spots. If a member who has signed up as tentative does not come online for the raid, they will not receive a penalty.